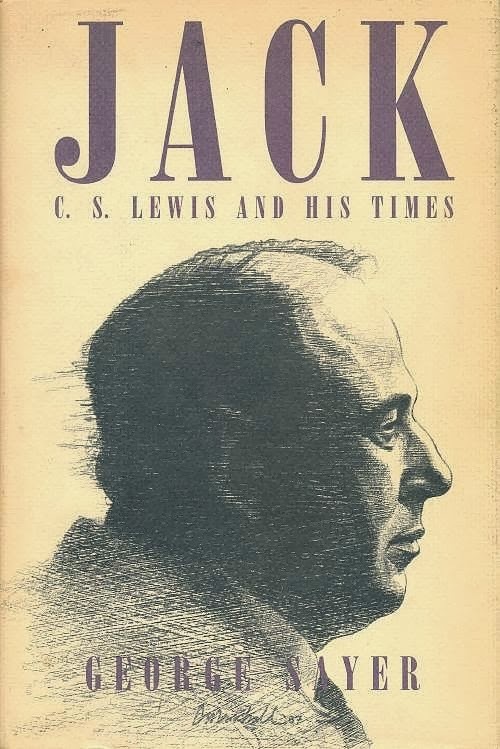 This morning Trevin Wax recommends Jack: A Life of C.S. Lewis , available as a Kindle edition for only $2.99. I've owned this biography, written by George Sayer, a personal friend and former student of Lewis, ever since it was first published in 1988 as Jack: C.S. Lewis and His Times. It is quite good, although more recent biographies like Alan Jacobs' or Alister McGrath's are too, and may be more objective. But if you want to know more about Lewis' life this is a good [and inexpensive] place to begin. He was a heavily built man who looked about forty, with a fleshy oval face and a ruddy complexion. His black hair had retreated from his forehead, which made him especially imposing. I knew nothing about him, except that he was the college English tutor. I did not know that he was the best lecturer in the department, nor had I read the only book that he had published under his own name (hardly anyone had). Even after I had been taught by him for three years, it never entered my mind that he could one day become an author whose books would sell at the rate of about two million copies a year. Since he never spoke of religion while I was his pupil, or until we had become friends fifteen years later, it would have seemed incredible that he would become the means of bringing many back to the Christian faith. Astonishing, too, that this almost unknown academic should become a popular broadcaster whose talks would play a valuable part in sustaining British morale during the darkest hours of the war. Although I became a friend of Lewis, I never got to the bottom of him. My object in this book is to present the factual background to the motivation and character of a remarkable man who has had, and is having, a profound effect on the modern world.